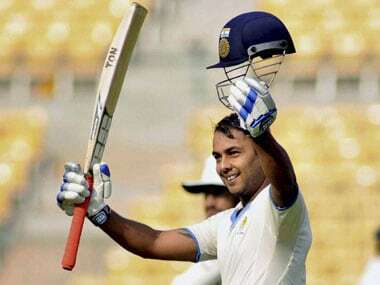 Mumbai: Stuart Binny, who has lost his place in the Indian Test and ODI teams, hit his ninth first class hundred - a blistering 156 - as Karnataka grabbed a huge first innings lead over Assam on day three of their Group B Ranji Trophy match. Assam have an arduous task to avoid an outright loss on the final day on Sunday at the Bandra-Kurla complex ground. The star on the penultimate day of the game was all-rounder Binny who played a sparkling knock, laced with 3 sixes and 17 fours, to puncture Assam's slim hopes of coming back into the game. Binny's century was the third in Karnataka's imposing first innings total of 570 and followed knocks of 128 by Robin Uthappa and 145 by captain Karun Nair who were not out last evening on 108 each in a team score of 223 for 2. For Assam, medium pacer Arup Das took 4 for 86, including the wicket of Binny, while his new ball partner Krishna Das claimed 2 for 95. Coming to bat for the second time, Assam lost opener Rishav who was castled by leggie Shreyas. Brief scores: Assam 325 and 48 for 1. Karnataka 570 (R Uthappa 128, K Nair 145, S Binny 156, C M Gautam 73; A Das 4 for 86). Dharamsala: A 134-run stand between opener Shivakant Shukla (83) and middle-order batsman Arindam Ghosh (51) brought Railways back in the match as they require 119 runs to win against Bengal on what promises to be an exciting final day of the Ranji Trophy group A encounter. Both players bat with an attacking mindset and will not hold themselves from playing strokes. Their real boost would be young medium pacer Sayan Ghosh (2/52 in 19 overs), who removed the two set batsmen to bring Bengal back in the game. Railways had recovered from the initial setbacks with another youngster Amit Kuila (3/42 in 22 overs) blowing away the top three within 22 runs. Earlier, Bengal added 6 runs to their overnight score of 208 for 9 as they ended their second innings at 214. Debutant Karan Thakur was the most successful bowler grabbing 4 for 45. Railways 105 and 196/5 (Shivakant Shukla 83, Arindam Ghosh 51, Amit Kuila 3/42, Sayan Ghosh 2/52). 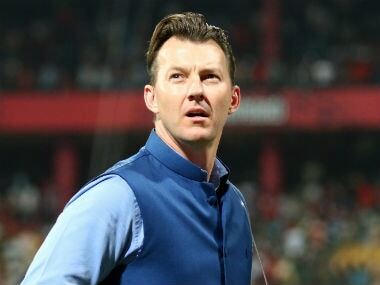 Mohali: Delhi produced a professional performance on the third day as they put Odisha on the mat with a 258-run first innings lead and then pressed for innings victory dismissing four opposition batsmen in the second innings. In reply to Odisha's 237, Delhi declared at 495 for eight as Milind Kumar (106 no) added 156 runs with Manan Sharma (81) as Delhi stretched their lead beyond 250-run mark. With 258-run deficit, Odisha finished the day at a precarious 109 for 4 with Ishant Sharma taking two wickets removing both openers Sandeep Pattanaik (27) and Ranjeet Singh (2) caught by Rishabh Pant. Brief Scores: Odisha 237 and 109/4 ( Gobind Poddar 52 batting, Ishant Sharma 2/17). Wayanad: Opener Sanjay Ramaswamy struck his maiden first-class century as Vidarbha produced an improved batting effort to pile up 315 for three in their second innings against Jharkhand in a Group B Ranji Trophy match. Ashish Kumar (1/56), Shahbaz Nadeem (1/79) and Vikash Singh (1/94) picked up a wicket each for Jharkhand. Vidarbha now lead Jharkhand by just 58 runs with just a day's play remaining. Earlier, Vidarbha conceded the vital first innings lead to Jharkhand. Sent into bat, Vidarbha came up with a pathetic batting performance to be bundled out for 105. Vidarbha: 105 & 315 for 3 in 96 overs (Sanjay Ramaswamy 102; Ashish Kumar 1/56). Jharkhand: 362 for 8 decl in 122.5 overs (Ishank Jaggi 112 not out; Akshay Karnewar 2/45). New Delhi: Out-of-favour India all-rounder Yuvraj Singh slammed an unbeaten 179 and opener Manan Vohra remained not out on 201, as Punjab made a strong reply to post 452 for two in their Group A Ranji Trophy match against Baroda. The left-right combo scored runs at almost fours runs per over after joining forces at 138 for two in the innings' 41st over. Punjab were overnight 121/1 with Vohra and Uday Kaul batting on 67 and 33 respectively. Cuttack: Tamil Nadu reduced Madhya Pradesh to 261 for seven in their first innings despite a 160-run partnership on the third and penultimate day of their Group A Ranji Trophy match. However, a late burst from off-spinner Washington Sundar (2/20) to remove Bundela and Saurabh left Madhya Pradesh once again reeling at 249 for six. Madhya Pradesh 1st innings: 261 for seven in 88.1 overs (Devendra Bundela 93, Saurabh Sharma 85; Washington Sundar 2/20). Hyderabad: Maharashtra produced a collective bowling effort to reduce Rajasthan to 299 for eight and seize the initiative in a Group B Ranji Trophy match. Chirag Khurana (2/24), Akshay Darekar and Mohsin Sayyed (2/62) shared six wickets between them for Maharashtra. If not for a magical batting effort tomorrow, Maharashtra are all set to take the crucial first innings lead over Rajasthan. Maharashtra: 461 all out in 147.4 overs (Naushad Shaikh 143, Rahul Tripathi 95; Pankaj Singh 4/62). Rajasthan: 299 for eight in 118.4 overs (Manender Singh 63, Siddharth Dobal 59; Akshay Darekar 2/31). New Delhi: Hardik Patel (4/71) and Rush Kalaria (3/40) shared seven wickets between them to bundle out Uttar Pradesh for 241 and help Gujarat take a healthy 106-run first innings lead on the third day of their Ranji Trophy Group A match. At stumps on day three, Gujarat reached 187 for five in their second innings to extend their overall lead to 293 runs at Palam grounds. Starting the day on 147 for four, UP lost overnight batsmen — Eklavya Dwivedi (28) and Mohammad Saif (4) — in consecutive overs within the opening hour. Saif took as many as 77 deliveries to score his four runs. UP then another batsman in Saurabh Kumar (15) to be reeling at 173 for seven. 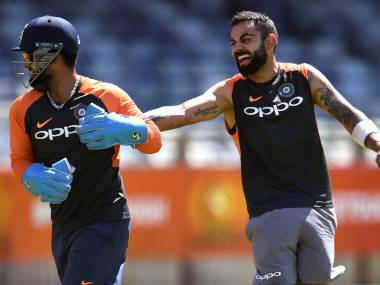 However, a crucial eight-wicket partnership of 62 between Kuldeep Yadav (25) and Imtiaz Ahmed (25) lifted the team to their eventual total of 241. Gujarat: 347 & 187/5 in 57 overs (Samit Gohel 50; Kuldeep Yadav claimed 3/69). Uttar Pradesh 1st innings: 241 (Hardik Patel 4/71, Rush Kalaria 3/40). Young opener Shubham Rohilla was keeping Haryana in the hunt with an unbeaten 75, with seven hits to the fence, when play was stopped because of insufficient light. Haryana, who conceded a lead of 150 in the first innings, did well on the field as Chahal (3/51), captain Mohit Sharma (3/37) and Harshal Patel (2/33) played key roles in bundling Andhra out for 220 in the second innings. Captain G Hanuma Vihari (50) and Siva Kumar (42) were the main scorers in the Andhra second innings. Although Paliwal departed before close, Rohilla remained unbeaten after facing 137 balls to carry forward Haryana's attempt for a victory on the final day on Sunday. Andhra: 253 & 220 (Hanuma Vihari 50, Siva Kumar 42; Mohit Sharma 3/37, Yuzvendra Chahal 3/51). Haryana: 103 & 138/3 in 47 overs (SG Rohilla 75 not out). Guwahati: Himachal Pradesh staged a comeback and were 232/6 in their Group C Ranji Trophy match against Hyderabad, taking their overall lead to 142 runs with four wickets remaining. Bowled out for 36 in their first innings, Himachal managed to limit Hyderabad to 126 all out with seamer Rishi Dhawan returning impressive figures of 7/50 at the Barsapara Stadium. At stumps on the third and penultimate, Himachal Pradesh's Robin Bist was unbeaten on 50, while Mayank Dagar was batting on 4. Paras Dogra top-scored for the hosts with 57 off 101 balls with the help of seven boundaries. 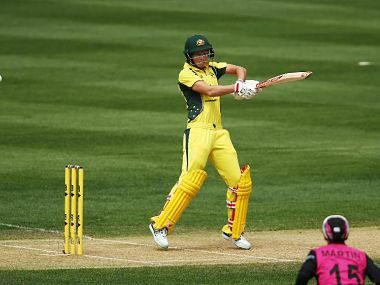 Bist hit four boundaries and two sixes while facing 113 balls.